Reliable methods to monitor and validate stem cell pluripotency are required to advance stem cell therapies and ensure patient safety. Electrical-based detection (EBD) methods are non-invasive and can be used to detect stem cell pluripotency in real-time, and avoid the cost and cell-damaging issues caused by traditional detection methods. However, past EBD methods have produced low current signals, preventing commercialisation. 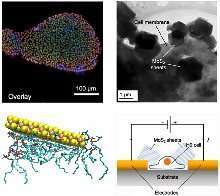 SUTD researchers Ph.D. candidate Sophia Chan and Dr. Desmond Loke, together with colleagues from Nanyang Technological University (NTU) and the Agency for Science, Technology and Research (A*STAR) have developed a method to achieve ultra-high bioelectric signals from human embryonic stem cells (hESCs). Recently published in ACS Applied Bio Materials, the research team achieved a 1.828 mA cell signal using direct current-voltage measurements and two-dimensional molybdenum disulphide sheets. This is two-orders of magnitude higher than previous EBD methods. "Stem cells are promising starting materials for currently untreated and life-threatening diseases. However, they are limited by readily available methods to ensure therapeutic safety. Our method is able to enhance native stem cell signals feasible for commercialisation to ensure therapeutic safety." says Chan. The researchers also demonstrate that the 2-D-MoS¬2 sheets enhanced bioelectric signals without affecting the native characteristics of the stem cells. From molecular dynamics (MD) simulations, the group deduced that the increased current flow was a result of the spontaneous interactions formed between the sheets and the cells.